The perfume or fragrance oil is a blend of essential oils and aroma compounds, fixative, and solvents used to give the smell of fragrance to the human body, objects, or the room. The number and type of solvent mixes with the perfume to determine whether a perfume is considered a perfume extract, Eau de perfume, Eau de toilette, or Eau de Cologne. Eau de Toilette is a type of fragrances with a light scent, with a durable 3-4 hours. Has high alcohol levels with concentrated ingredients fragrances range 4-8%. These fragrances are generally present in the form of spray, while Eau de Perfume is a kind of Eau de Perfume fragrances that has possess alcohol levels slightly, with concentrated ingredients fragrances as much as 8-16%. So whose going to be quite durable up to 4-6 hours. At this time the review of two kinds of perfume will be represented by Acqua Di Gio and Acqua Di Gioia. Acqua Di Gio was created in 1996 by Alberto Morillas and this fragrance is made by the inspiring of Pantellerie and Armani created the aroma of Aqua di Gio for men and women. The fragrance for men is a scent of freedom, full of wind and water. The composition is built by sweet and salty notes of sea water and nuances of sunny warmth on your skin. 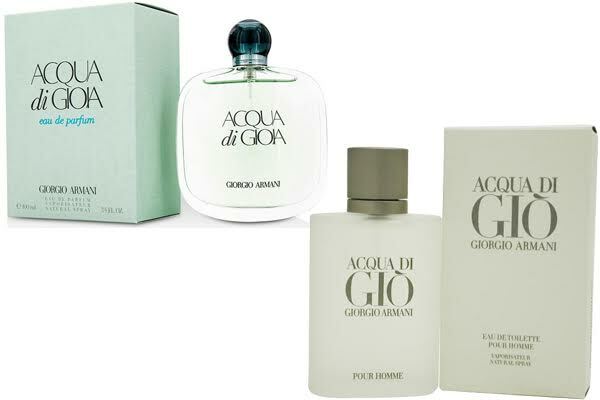 Aqua di Gio is full a creation of scorching Mediterranean sun. Bitter citrus with aromatic nuance of rosemary intertwines with salty, sea nuances and pellucid hedione. Sharp notes of spices are softened by woody base with warm, musky trail. The reason for its universal appeal its just the right blend of floral, fruity and musky notes to create an aroma that is pleasing for men to wear. While for a woman, You can feel and vouch for its pleasant effect on my olfactory senses. The overall effect is not too overpowering, and the transition between notes is subtle. It’s a fragrance that lends itself well to daytime wear as well as evening wear. Take a look: Acqua Di Gio vs Armani Code. Acqua di Gioia is a fragrance by Giorgio Armani that started producing in March 2010. Seductive sea aromas in this fragrance are used as creators inspiration. Composition of this perfume can be compared with woman who has characteristic of strong, dignified and free spirit but in perfect harmony with nature. Inspired by some summer holidays spent on Pantelleria and Antigua islands and this fragrance was lead by the idea of escape into nature, a heavenly place of real holiday where the energy is restored by necessary to our body and soul, and natural balance is created. Its flacon was made as a natural shape and also water drops which are clear, airy, and pellucid. The fragrance is known as a blend of refreshing notes of crushed mint leaves and lemon Limone Primo Fiore Femminello from Calabria. Structure of the composition pushes the limits from fresh citruses and a floral heart, encompasses aquatic jasmine, dewy peony and pink pepper, while a base closes with cedar, yellow sugar and labdanum. Acqua di Gioia was innovated by three perfumers: Loc Dong, Anne Flipo and Dominique Ropion, who see it as Eve’s seduction and as fragrance turned completely towards the nature. Both of this fragrance is different in type, one is Eau de Toilette and the other is Eau de Perfume. If you want more long-lasting fragrance, you can choose Acqua Di Gioia. But, it depends on what taste you like too, knowing that these fragrances are totally different in having the scents.